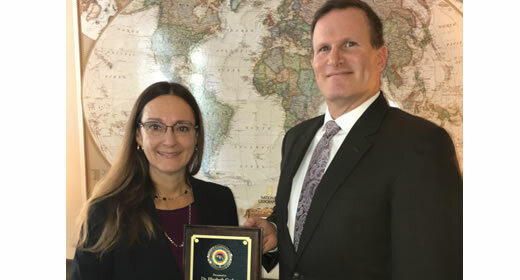 Professor Elisabeth Gerber was recognized for her work with the U.S. Department of Justice’s International Criminal Investigative Technical Assistance Program (ICITAP). Greg Ducot, acting director of ICITAP, gave her this recognition in honor of her contributions to ICITAP’s University Partnership Program. Through Gerber’s leadership, the Ford School’s Applied Policy Seminar (APS) students have worked on ICITAP projects. ICITAP helps foreign governments develop professional and transparent law enforcement institutions and provides international development assistance. The University Partnership Program allows for an information exchange between universities (George Mason University, American University, and Syracuse University are also partners) and ICITAP, providing a mutually beneficial opportunity for students to learn about ICITAP and for the program to gain an outside perspective. Gerber was first introduced to ICITAP by a Ford School alum in 2013. Since then, five teams of APS students have completed projects over the years. APS opportunities give students hands-on learning experience with an organization, often focused on data analysis and policy development. She also supervised an independent study partnering with the organization. The projects have focused on supporting ICITAP’s technical assistance work, which has included the development of training materials, assistance with strategic planning, and analysis of country-specific data. This work has contributed to a groundbreaking recent report on Sustainable Institutional Development. This recognition highlights the work being done at the Ford School among students, leaders and researchers, and the benefits for the partner organizations. Read more about the Department of Justice’s ICITAP here. Elisabeth R. Gerber is the associate dean for research and policy engagement and the Jack L. Walker, Jr. Professor of Public Policy at the Ford School, as well as a research associate at the Center for Political Studies, and the Institute for Social Research.